Actors Viggo Mortensen and Hugh Grant are among more than 25 celebrities and public figures expressing "horror" over President Donald Trump's decision to cut funding to the U.N. agency for Palestinian refugees. 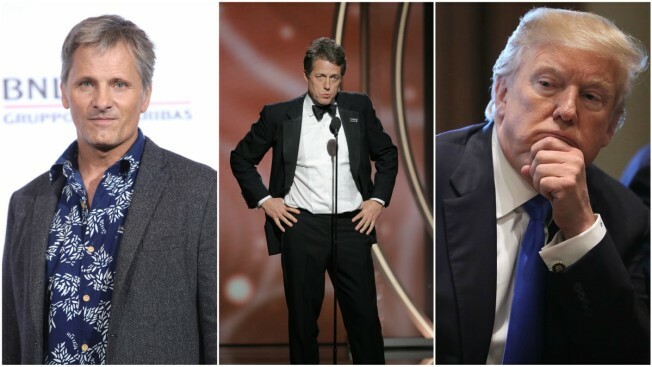 Actors Hugh Grant and Viggo Mortensen are among more than 25 celebrities and public figures expressing "horror" over President Donald Trump's decision to cut funding to the U.N. agency for Palestinian refugees, an advocacy group said Thursday. "The real target of this lethal attack is the Palestinian people themselves," the group said in a joint statement. "It has been launched with the clear aim of dismantling their rights, by dismantling the institution that is charged with protecting them." Actresses Gillian Anderson, Olivia Wilde, Emma Thompson and Tilda Swinton were also among the signatories. The letter was released by the Hoping Foundation, a London-based group that assists Palestinian children. Expressing frustration with a freeze in Mideast peace efforts, Trump this month blamed the Palestinians for the deadlock and threatened to cut U.S. funding. Washington subsequently suspended a $65 million payment to UNRWA, the U.N. agency that provides education, health care and other social services to over 5 million Palestinian refugees and their descendants scattered across the Middle East. On Thursday, Trump said in Davos, Switzerland, that the Palestinians must return to peace talks to receive U.S. aid money. The United States is the largest single donor to UNRWA, and the agency has launched a global fund-raising appeal in hopes of closing the gap. In all, it provides hundreds of millions of dollars a year to the Palestinians. "We stand for dignity for the most vulnerable, and we stand with Palestinian refugees who are facing a terrible moment," the statement said. The celebrities called on the U.N. chief to convene a conference to establish a stable funding system for the agency. Meanwhile, the leaders of 21 international humanitarian groups urged the U.S. to reconsider its decision to withhold the funding to UNRWA, warning of "dire consequences" if funding is cut. The groups said they are alarmed by the Trump administration's link between aid and political objectives. This marks a "dangerous and striking departure from U.S. policy on humanitarian assistance," the groups wrote in an open letter to Washington's U.N. Ambassador Nikki Haley, published Thursday. Haley has linked aid to the Palestinians to their willingness to resume negotiations with Israel.